What are Garden Trellises Used For? Do-it-yourselfers will find trellises easy to make with lightweight wood that may be already lying around, in a supply shed, garage, or side yard. Whether bought or made, a trellis needs to be strong enough to support the weight of plants as they grow and mature, and durable enough to withstand wind, rain, and snow. 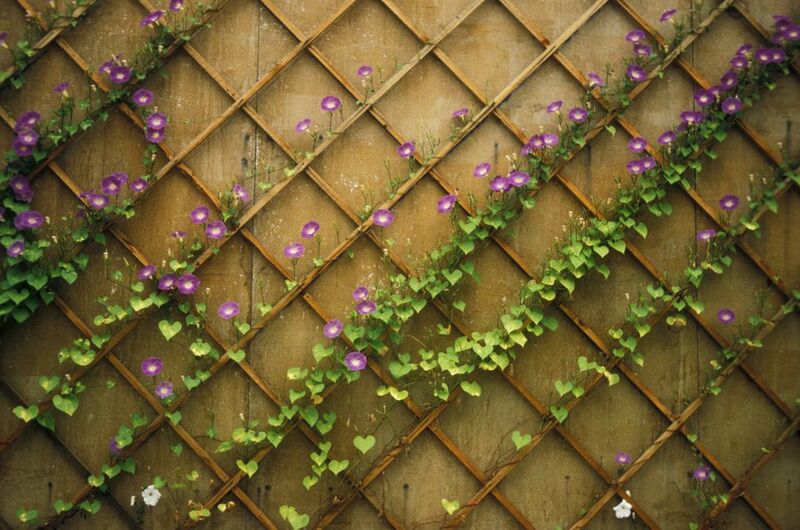 Monofilament or wire trellises are often formed into simple but elegant criss-cross patterns against plain walls upon which to train fast-growing vines like creeping fig or lonicera. The result is a living wall and can be quite stunning if pruned precisely and often. More substantial trellises should be built with cedar, redwood, or treated lumber, which can be painted. Make sure that cedar or other wood you choose is free of knots, which indicates they can break more easily. Esapaliered trees and shrubs are also a form of a trellis. Like vines on a trellis, small trees are trained to grow flat against a wall, spreading and anchored to wire, string, or another anchor in a decorative fashion. This also disguises an otherwise unsightly wall or fence. Espalier is for someone who likes to garden and is good with garden pruners and snips. It also helps to be patient and not become easily frustrated. In the past, trellises—or trelliage—were considered art for the garden. It was designed to be beautiful to look at, even during times of the year when no vines or plants were growing on them for support. Working for King Louis XIV in France, landscape architect Andre Le Notre designed the elaborate garden at Versailles—considered one of the finest and certainly grandest formal French gardens in the world. Trellises and other outdoor structures gave a sense of architecture to the landscape, along with formality and an impressive scale. Le Notre's emphasis on the importance of trelliage at Versailles can be seen throughout the world, as landscape architects and garden designers use it on facades and in gardens. The first wallpaper design that William Morris ever attempted was in 1862, inspired by a lovely view in his English garden, of a trellis with a vine and birds. He went on to become one of the finest wallpaper designers in history, known for creating beautiful patterns inspired by nature. Morris & Co. is still in business.